Slant Eye For The Round Eye: Because You Know You Wanted More On "Stories from Chinese America: The Arthur Dong Collection, Vol. 2"
Because You Know You Wanted More On "Stories from Chinese America: The Arthur Dong Collection, Vol. 2"
And since you did indeed want to know more - well - I give you more. Stories from Chinese America: the Arthur Dong Collection, Vol. 2 brings together an anthology of films spanning over 25 years showcasing Dong’s historically acute focus on Chinese Americans at crossroads with Hollywood, pop culture, tradition, and immigration. 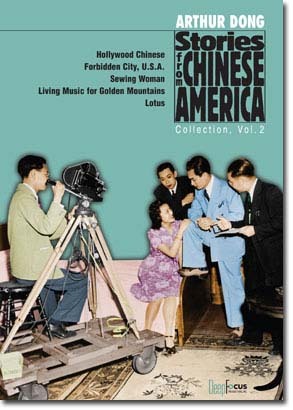 The 4-disc boxed-set includes Hollywood Chinese Collector’s Edition, Forbidden City, U.S.A. Collector’s Edition, Sewing Woman, Lotus, and Living Music for Golden Mountains, Dong’s 1981 documentary directorial debut. Also included is the restored and newly scored 1916 film, The Curse of Quon Gwon, the earliest known Chinese American feature film ever made. Visual Communications hosts a celebration for the release of Stories from Chinese America: the Arthur Dong Collection, Vol. 2. Headlining the event will be the world premiere of the newly scored and restored 1916 film, The Curse of Quon Gwon, the earliest known Chinese American feature film. Dong will be on hand to give a tour of the many hours of extra archival and interview footage that comes with his new DVD anthology. A reception and DVD signing follows. Saturday, November 6, 3PM @ The National Center for the Preservation of Democracy, Little Tokyo. Tickets: (213) 680-4462, ext. 32, or www.vconline.org. San Francisco State University’s Asian American Studies Department presents a celebration for the release of Stories from Chinese America: the Arthur Dong Collection, Vol. 2. Headlining the event will be the Bay Area premiere of the newly scored and restored 1916 film, The Curse of Quon Gwon, the earliest known Chinese American feature film. Dong will be on hand to give a tour of the many hours of extra archival and interview footage that comes with his new DVD anthology. The party includes a guest appearance by the Grant Avenue Follies and a reception with door prizes. Proceeds support SFSU’s Asian American Studies programs and students. Nov. 13, Saturday, 12 noon @ the Four Star Theatre. Tickets: Brown Paper Tickets or the Four Star Theatre box office. More info: www.sfsu.edu/~aas.